Well at least this episode explains the Lucy scenes from the season 6 finale, only issue is that it was edited and structured in such a way in the finale to make it seem like the events are way more interesting than they actually are. SO Lucy was born in the knock-off Enchanted Forest and curses yadda yadda. This episode is classic OUAT, in that it’s convoluted as F. So here is the twist, first the show makes you think that Victoria a.k.a Lady Rapunzel Tremaine cast the curse only to find out that her daughter Druzilla a.k.a Ivy had a big hand it in it and that it was her curse. Turns out, No Regina cast the curse to save Henry for plot-poison. And also it’s part if the curse for Lady Rapunzel Tremaine to think she cast the curse. Then Ivy tries to get Anastasia’s’ magic but it was all a rouse by Gothel to bring back her coven, or the Eight Witches which Ivy is part of, but Gothel dispatches Ivy because double crosses. Anyway Surprise the Coven is the bad guys and the were only clumsy established with regard to the Eloise Gardner case for maybe some reason. And Zelena is back. Her name is Kelly because you get it right? RIGHT? GREEN! Anyway for some reason, not explain she and Robin are ALSO in the Knock-off Enchanted forest. Sure every character get three names but you can’t name the realm there are all from one? Geeze writers. Also Zelana has her magic back in said realm? How? Remember just last season she lost it? Now it’s back? Oh geeze. And then there’s Lucy and Henry. Lucy is in her sleeping death curse thing but true loves kiss from Henry, who now BELIEVES, doesn’t work because Lucy doesn’t believe. To the show’s credit this was established in the first season when Snow White forget her love for David and I guess it worked when Hook tried to kiss Emma out being the Dark one in season 5. Trouble with this scene of Henry not waking Lucy is it doesn’t feel earned. 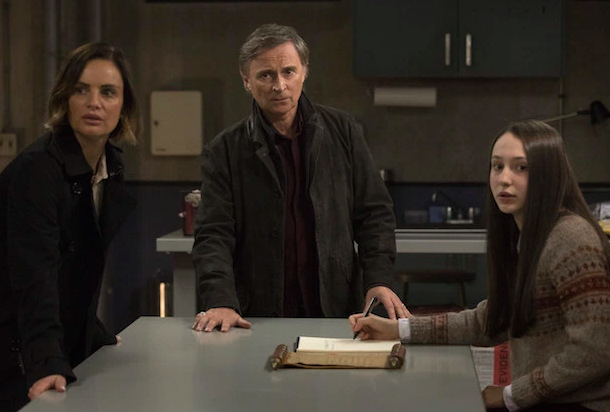 First season did this scene at end of the season, a full season with 20+ and multiple scenes with Emma and Henry. There wasn’t even a scene in the flashback showing Lucy and Henry’s father/daughter dynamic, basically goes from baby and Ivy’s curse prophecy/warning about Lucy’s eighth birthday to her eighth birthday. While I enjoy Zelena, this episode feel flat which in a way is impressive since it reveals a lot and was really convuled in its twist but it was a big load of meh. Anyway Once upon a Time in now on hiatus till March 2nd 2018.